The spectrum of malnutrition encompasses the entire range of problems that can occur when dietary energy and/or nutrient intake are insufficient, excessive or simply imbalanced. At one end of the energy malnutrition spectrum is the problem of undernourishment and undernutrition, often described in terms of macronutrients. Low dietary energy supply, wasting, stunting, underweight and low body mass index (BMI) are all used to identify the problem. This energy deficit leaves its victims prone to illness and early death; it also makes them listless and unable to concentrate. At the other end of the spectrum is the problem of overnourishment, leading to overweight and obesity. A high BMI is one indicator of the problem. Already a well-known phenomenon in developed countries, obesity is increasing among new urban dwellers in the developing world. This issue has not been given much attention in developing countries because of the more compelling problems at the other end of the scale. However, the consequences of obesity - which decreases productivity and increases the risk of heart disease, hypertension, diabetes and certain cancers - can be as serious as the consequences of underweight. Because they are growing rapidly, infants and young children, especially under two years old, need foods rich in energy and nutrients. Poor diets prevent children from achieving their full genetic potential. Severe malnutrition can cause early death, permanent disabilities and increased susceptibility to life-threatening illnesses. The growth of children is a good indicator of their overall health status. 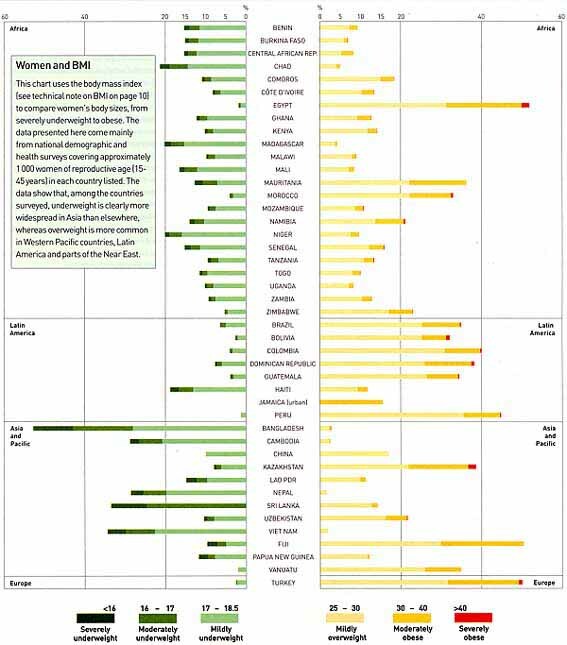 The graph below shows the prevalence of undernutrition among young children in developing countries. The figures on these pages show the energy spectrum and related physical manifestations in adults, as well as the latest information on children's undernutrition. Nutritional status of adult women is discussed on pages 11-12. A diet unbalanced in macronutrients, the energy-providing food components, is also a cause for concern even when total energy intake is adequate. However, the healthy range of macronutrient intake, expressed as a percent of total energy, can be broad: 55-75 percent from carbohydrates, 15-35 percent from fats and 10-15 percent from proteins. Superimposed upon the energy intake spectrum is the global problem of micronutrient malnutrition. Micronutrients - minerals and vitamins - are needed for proper growth, development and function. Deficiencies are particularly common among women of reproductive age, children and people with compromised immune systems, such as people with AIDS. Iron deficiency anaemia affects approximately 1.5 billion people, mostly women and children. Iodine deficiency disorders affect about 740 million people worldwide. Vitamin A deficiency blindness affects around 2.8 million children under five years old. More than 200 million people are considered vitamin A deficient. Calcium deficiency in pregnant and lactating women can affect the development of their children, and appears as osteoporosis later in life. Severe vitamin C deficiency, scurvy, is mostly a problem in very deprived and refugee populations. Specific requirements have been established for most micronutrients. In most cases, deficiencies can be corrected by consuming a well-balanced diet. Variety is the key. * Enriched with iron in developed countries. Body mass index (BMI) is an anthropometric standard for defining the body composition of men and women. Initially it was used to measure obesity in developed countries, but it is now applied to underweight and overweight adults in countries throughout the world. BMI provides a simple, convenient and relatively inexpensive indicator for assessing whether a person is taking in too little or too much energy. BMI is a crude measure of nutritional status; additional information is needed to determine a person's health status. Thresholds may have to be adapted for specific groups of adults, such as adolescents, pregnant women and the elderly. What does it mean to have a low or high BMI? The figure below shows a range of BMI scores from severely underweight (<16) to severely obese (>40). The risk of health problems is greater for people with BMI at either end of the spectrum than for those in the middle range (18.5-25). In this publication, 18.5-25 is considered to be the healthy range of BMI for adults. These thresholds are recommended by FAO, the World Health Organization and the International Dietary Energy Consultative Group, and their use is increasing all over the world. The cut-off point of 18.5 for defining underweight and 25 for defining overweight is not universally accepted. Some researchers believe that cut-off points based on country-specific reference groups should be established to reflect differences in height and muscle mass. Concerns about the universal applicability of the body mass index should be kept in mind when interpreting the prevalence of underweight and overweight people in selected countries. In households where food security is precarious, women are often more vulnerable than men to malnutrition because of their different physiological requirements. Women are smaller and have lower metabolic rates and less muscle on average than men, which means they need about 25 percent less dietary energy per day. Yet women require the same amount or more of many nutrients. To compensate for their smaller portions of food, they have to eat a much higher proportion of nutrient-rich foods. The result of recent research on men's and women's requirements for some nutrients is shown in the table below. Looking at daily requirements alone, however, can present a misleading picture of the actual needs of women. In most cases, a woman requires a higher intake of vitamins and minerals in proportion to total dietary energy intake than a man. For example, a woman needs 2.5 times more iron than a man. Translated into units of food energy in the context of her smaller intake, her requirement is 3.5 times greater. Women and men need the same amount of calcium and vitamin C, but women's diets need to be 40 percent richer in these nutrients. 1 Based on total dietary energy intake of 2 000 kcal per day. 2 Based on total dietary energy intake of 2 800 kcal per day. 3 Based on 12 percent bioavailability. * These figures do not reflect the greater needs of pregnant and lactating women. See text for details. Source: For vitamins and minerals; Joint FAO/WHO Expert Consultation on Human Vitamin and Mineral Requirements, Report on Recommended Nutrient Intakes. FAO Bangkok, September 1998 (in press). In some societies, tradition dictates that able-bodied men eat first - before women, children and the elderly. Some observers have taken this practice as a probable indication of undernutrition for those waiting at mealtime. energy expenditure - What are the family members doing during the day? How much energy is needed to plough by hand, fetch fuelwood, work in the house, operate a market stall? body mass - How big are the family members? Is their weight in keeping with their height, age and reproductive status? A 1996 review of literature by the International Food Policy Research Institute concluded that, despite extensive study, "evidence of pro-male biases in food consumption is scarce". Indeed, once adjusted for activity patterns and body weight, the pro-male bias seen in many of these studies turned out to be slight. Still, research is needed on how people make decisions about household food allocation. Caretakers should be educated about the specific nutritional needs of all members of their households. When women are pregnant or lactating, their foods need to be even richer in energy and nutrients. During pregnancy a woman needs an additional 300 kilocalories per day after the first trimester and 500 kilocalories more while her baby is breastfeeding. During pregnancy she requires almost as much protein as a man (60 g vs. 63 g daily) and more when lactating (65 g/day). A pregnant woman needs up to four times more iron, 1.5 times more folate and 20 percent more calcium than a non-pregnant woman. During lactation, she needs 40 percent more vitamin A and C, at least 15 percent more vitamin B12 and extra levels of micronutrients. Lack of access to adequate amounts and variety of food places pregnant women at greater risk of complications during pregnancy and delivery. Many infant and young-child deaths in developing countries are attributable to the poor nutritional status of their mothers. Teenage mothers and their babies are particularly vulnerable to malnutrition. Girls generally grow in height and weight until the age of 18 and do not achieve peak bone mass until about 25. The diet of a chronically hungry adolescent girl (such as the Pakistani bride described on page 14) cannot support adequately both her own growth and that of her foetus. Malnourished young women often give birth to underweight babies. One way to assess nutritional status in women is through use of the body mass index (BMI). The figure opposite charts the spectrum of BMI among women in a number of countries. BMI tells us two things about the nutritional status of women. First, since many nutrition-related problems are linked to underweight or overweight (see pages 9-10), BMI gives an indication of women's health status. Second, BMI is an important indicator of the probable outcome of a woman's pregnancy. A study in India, for example, found that 41 percent of babies born to moderately underweight women (BMIs of 16 to 17) were born underweight (less than 2 500 g). The figure climbed to 53 percent when the mother's BMI dropped below 16. Likewise, an obese woman runs a much higher risk of complications during pregnancy and of having a difficult delivery. Undernourishment is typically reported in terms of the percentage of a population with inadequate diets, but what does it mean for an individual to live day in and day out without enough food? In conducting diet studies, project staff collect information about the ways foods are prepared, the size of servings consumed and the frequency of consumption. Information is generally collected for one day, but since meals vary and one day may not be representative of the overall diet, it is preferable to obtain information for three days or even a full week. Some studies look at seasonal changes in diets. The next step is analysis of the nutrient values of the foods consumed. 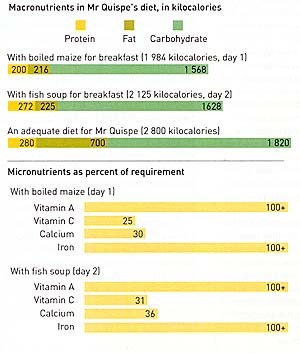 These calculations reveal the sources and total amounts of dietary energy and nutrients in the diet. These profiles present actual diets of three chronically hungry people - a Bolivian man, a Zambian boy and a recently married Pakistani adolescent girl. * These individuals face continuous nutritional vulnerability because they live in households lacking the resources to produce, buy and prepare enough food for a healthy diet, although meals may vary by day and by season. Even when a country has enough to feed its population adequately, some groups within a society may be vulnerable to food insecurity. Within communities, some families are at greater risk of malnutrition than others, and within families some members are at greater risk than others. Young children and pregnant and lactating women are the most vulnerable groups. But undernourishment cuts across all of society: it means a child of school age may not gain the full benefits of education, a labourer may be less productive and a young woman may risk miscarriage. Seven-year-old Mumba Mwansa lives in northern Zambia near a lake on which his father fishes in the employ of another man. Mumba's mother grows vegetables such as sweet potato, cowpeas, pumpkin and groundnuts. His father grows cassava during the rainy season, when the lake is closed to fishing. During the dry season, Mumba has boiled sweet potato with some roasted groundnuts in the morning. He takes a snack of roasted cassava to eat at school, and in the afternoon he shares a family meal of cassava nshima (a thick porridge) and boiled bream fish. At night, his family has a fresh pot of nshima with fish relish. Thanks to fish and cassava flour, Mumba's dry-season diet is above minimum requirements in terms of carbohydrates and protein. However, he does not get enough fat, iron or calcium, all necessary for growth and health. The wet season is more difficult. Mumba's parents go to the fields early, so he either roasts cassava himself or goes without breakfast. In the afternoon, Mrs Mwansa prepares nshima and a relish of vegetables and groundnut flour. The boy snacks on three small mangoes in the morning and again in the afternoon, the Mwansas do not have an evening meal. At this time of year, Mumba's diet does not provide enough energy for daily activities, health and growth. A boy of his age needs 1 800 kilocalories each day, yet on this day, he only consumed 1 121 kilocalories. Seasonal hunger and lack of some essential foods throughout the year contribute to the high levels of stunting found in the area where Mumba lives. * Individuals' names have been changed. The Zambian diet demonstrates how a person can be adequately fed in one season and undernourished in another, especially dangerous for a growing child, as it can lead to stunting and other problems. This diet also shows that important nutrients can be lacking even when dietary energy is sufficient. The Bolivian diet is an example of the importance of indigenous foodstuffs, which often do not appear in official statistics on food supply. Yet even with these nutritious traditional foods, people can be seriously undernourished. Pedro Quispe, 35, supports four children and his wife by working on a farm near Lake Titicaca in Bolivia. Some mornings he begins the day with a meal of boiled maize, some chuño (a preserved potato) and fried broad beans. Two or three times a week, his wife serves him wallake, a soup made of carachi fish from the lake plus potato, onion, peppers (ají amarillo), koa (an aromatic herb), lard and salt. Mr Quispe walks one hour to get to the fields. After working for several hours he has a snack of chuño eaten with sauce made of peppers (ají molido), onion and tomatoes. On his return home in the evening his wife serves him soup made of rice, potato, onion, carrots, lard and salt. The soup is eaten with a paste called quispina made from a grain (Chenopodium quinoa) indigenous to the Andean Highlands. He enjoys a cold barley drink, called pito de cebada retostada, with water and sugar. Mr Quispe needs a lot of energy to do agricultural work, walk long distances and do the heavy tasks that his wife cannot do in the home. It is estimated that a man in this mountainous region needs at least 2 800 kcal per day to maintain his level of activity and health. Yet Mr Quispe's diet provides only 75 percent of the dietary energy he requires because he consumes too little fat and carbohydrate. Because his diet is poor, he also lacks calcium and vitamin C.
The Pakistani diet illustrates concerns about poor nutritional status in adolescent mothers, a factor contributing to high levels of infant and maternal mortality in many parts of the world. The diets described here show what these individuals ate during two 24-hour periods and are presented to illustrate common eating patterns; they are not statistically representative of the diets of the larger population. Tahira Khan is a newly married 15-year-old in an isolated hill community in Pakistan. In the morning she fetches water to boil for chai (tea), which she drinks with milk and sugar. She and her mother-in-law prepare the family breakfast; after the men leave for the fields Tahira eats her share, one paratha (a type of pancake) made of whole wheat flour and ghee (butter). Once or twice a week she also has an egg fried in ghee. She and her mother-in-law spend most of the day on household chores. In the afternoon Tahira eats a chapati, a light white bread, with potato and eggplant flavoured with tomatoes, onions and red pepper, cooked in ghee. When the men return from the fields, Tahira serves their evening meal and then eats hers: another chapati and mixed vegetables cooked in ghee. As the village is difficult to reach, the family depends on their gardens for most of their food, so the variety is limited. Tahira's diet contains nearly adequate levels of protein, but it is of low quality because it comes mostly from wheat. Pulses improve the quality of the protein but she does not get enough of them. Her diet is particularly deficient in fats and also lacks sufficient carbohydrates. Her limited diet is a concern because she is still growing. In particular, she needs more calcium to nourish her future children and to be stored for her later years. If Tahira becomes pregnant, she and her infant will be at risk because of her diet. Poor nutritional status contributes to high levels of infant and maternal mortality in Pakistan. In the battle against global hunger a new tool has emerged to help decision-makers direct interventions to people most vulnerable to food insecurity. "Vulnerable group profiling" is a means of identifying who in a given population is hungry, why and, by implication, what can be done about it. This analytical method has been developed as part of the Food Insecurity and Vulnerability Information and Mapping System (FIVIMS) initiative. It can be applied alone or in combination with other vulnerability assessment methods. The results can be startling and should provide powerful impetus to action. For instance, in Benin a profiling exercise showed that almost half the population is vulnerable to food insecurity; FAO estimates that about a third of these vulnerable people are already undernourished (see pages 17-18). Determining the vulnerable groups in a country requires extensive consultation. A good starting point is a national brainstorming session that engages a broad group of stakeholders, including representatives of academic institutions, business associations, cooperatives, farmers' groups, government ministries and agencies, local authorities, non-governmental organizations, tribal groups, and women's associations. Such a session was held in Benin in May 1999, with 40 participants representing all regions and sectors of society. Chosen for their practical knowledge and experience of food security conditions in the country, the participants identified eight livelihood groups and three demographic groups vulnerable to food insecurity. 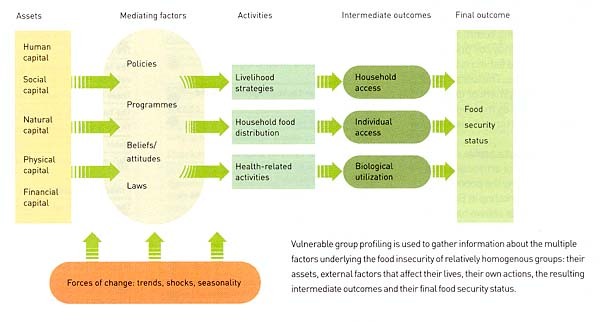 factors making them vulnerable to hunger and malnutrition. There are as many ways to classify hungry people as there are causes for their hunger. A particularly useful means of classification is by primary source of livelihood, since it is easy to apply and integrates the multiple factors underlying food insecurity. Other bases for classification can also be effective provided that they are comprehensive and can be applied across the country without double-counting. Source: Results of national brainstorming sessions held in 1999 in the countries mentioned. Census data and other survey results can then be used to calculate the proportion of the national population represented by each vulnerable group. Groups that are broadly defined initially may have to be broken into distinct subgroups to ensure that food security actions are appropriate. the probability of shocks, such as falling commodity prices, drought, conflict and catastrophic illness. Artisanal (small-scale) fisherfolk are an example of a livelihood group that is relatively homogenous, common throughout the world and becoming increasingly vulnerable to food insecurity. For these reasons and because of the availability of relevant data, artisanal fishers were the first livelihood group to be profiled using the new FIVIMS approach. Between April and June 2000, a general review of conditions contributing to the vulnerability of this group was conducted, and vulnerability profiles were developed for artisanal fishers in Benin, Guatemala and Viet Nam. To develop these profiles, FAO turned to secondary literature and consulted people with knowledge of artisanal fishing communities. In the cases of Guatemala and Viet Nam, light surveys were required to supplement the information. Comprising about 8 million people, or more than half the seagoing fishers worldwide, artisanal fishers work from unmotorized boats without decks and/or cast large nets from the beach. Unlike large-scale fishing fleets that remain at sea for days or weeks at a time, most return to shore each day. Coastal artisanal fishing is a communal activity centred around the village landing site from which boat crews set out each day. Buyers and sellers congregate at the landing site; nearby, women clean and smoke or dry part of the catch. Artisanal fishing communities are closely knit social units, often comprising one or a few extended families who are proud of their fishing tradition. However, these communities are often isolated from the rest of society and thus tend to be marginalized. Artisanal fishers constitute one of the weakest livelihood groups in terms of market power and political influence. ill health caused in part by poor quality drinking-water, inadequate shelter and high incidence of communicable disease. Artisanal fishers and their families number nearly 400 000, or 8 percent of Benin's population. Among the most food insecure are full-time sedentary fishers without land. They live in settled fishing communities on the seacoast, where sandy soil precludes agricultural activity and fishing is the main source of family income. The worst-off in this group own no equipment or gear, receive very low wages as members of fishing crews and have limited cash to cover basic expenses. These pages present a profile of the typical characteristics of artisanal fisher households, particularly the poorest, which was developed in a workshop in Benin in May 1999. Each variable shown has been assessed as to its potential for creating either risk or opportunity. The box on page 18 elaborates on the most pressing food security concerns identified in this profile and indicates actions to address them. A typical household has two income earners, one male and one female, and four to five dependents, of whom at least one is under five years. At any given time, at least one household member is likely to be suffering from malaria. School is free and school-age children are enrolled. The mother cares for children, maintains a kitchen garden and provides food other than fish. The father provides fish as well as cash for expenses such as school costs, clothes, ceremonies and gifts. The mother is a member of a tontine, a traditional social insurance and microcredit society for women. The father has strong links with other members of the fishing unit. Access to the sea and to landing areas on the beach is free. Mangroves provide fuelwood for cooking and smoking fish; coco tree trunks are used for shelter. The household lives in a shelter made of coco trunks. The mother keeps a kitchen garden in which she grows tomatoes, onions and green vegetables for home consumption and sale. The household does not own any animals. The father does not own any fishing equipment. There is a basic health care unit nearby. The health care unit is rarely used. There is a road along the coast. Water is available from wells in the village. Well-water is often not clean. The household has no private savings. The mother owns a stake in the revolving fund of the tontine. There are regulations restricting overuse of large nets. A regional project to support artisanal fishing in coastal West Africa, funded by the United Kingdom, has just started. Lack of coordination among increasing numbers of NGOs is perceived as a problem. One day a week the fisherfolk refrain from fishing and from eating fish to avoid "bad luck". This helps to diminish overfishing. No laws with food security impact reported. Each day boat owner gives the father a small share of cash earned from sale of the day's catch and some fish. Mother earns cash from fish she buys, smokes and resells. Father migrates with fishing crew to look for work in Cotonou port and occasionally sends back small remittances. Mother sells garden produce and prepares and sells coconut oil and artisanal salt. Food, loan repayments, tontine payments, other (alcohol, school costs). Food, tontine payments, other (alcohol, health costs). Maize with sauce of tomatoes, palm oil, onion, green vegetables; fish, usually cooked in sauce or smoked. Cassava and sauce of tomatoes, palm oil, vegetables; smoked fish on rare occasions. Households switch to cheaper foods and consume less during rainy season. Mother and children eat together; father eats on his own. All eat the same foods. Infants are breastfed; weaning starts too soon, at three months, with a maize porridge. Depletion of fish stocks and destruction of natural sea habitats. Devaluation of CFA (West African) franc in January 1994 caused many boat owners' costs to increase substantially more than price of fish. To compensate, they now take a greater share of the fish catch, leaving less for crew. Income declines sharply during the low fishing season. Diet is less varied and malaria and respiratory infections are more frequent. Incidence of malaria, head colds and diarrhoea is high among children under five years. Stunting (low height for age) affects around one-quarter of children under five years in coastal areas of Benin. In administrative districts on the coast, 62 percent of children under two years suffer from iron deficiency and 52 percent are anaemic. Health risks constitute a major vulnerability factor for maritime artisanal fishers in Benin. Malaria is endemic and diarrhoea and respiratory infections are common, especially in the rainy season when people are weakened by food shortages. Although basic health care is available, vulnerable households rarely use it. Little effort is made to boil well-water or observe other hygiene practices that help prevent disease. Available food is shared equally, but infants are weaned too early and weaning foods do not provide adequate nutrition. Malaria eradication, a global WHO priority, would be of great benefit. Other possible actions include programmes that support improved weaning practices, supplementary feeding for malnourished children and protecting the drinking-water. These should be managed locally to avoid uncoordinated and duplicated actions that demand too much of the intended beneficiaries' time. Lack of financial and physical capital is a major problem for vulnerable fishing households. A fisher's wage is based on the amount of capital he brings to the boat crew. A crew member who does not own at least a share of the fishing nets and other gear earns a very low wage. In the rainy season, when the husband migrates with the crew to find non-fishing work in Cotonou, the remittances he sends home are paltry. During the rainy season the wife's only other source of income is the sale of artisanal products and food from her garden. Often this is not enough to cover basic needs and she must resort to the use of credit to buy food. The result is greater indebtedness and hunger. Women in coastal communities of Benin belong to tontines, traditional social insurance and microcredit societies for women, to which they contribute and from which they can borrow in time of need. These constitute a useful but small capital asset which could be strengthened to provide funds for investment in small-scale, income-generating enterprises. 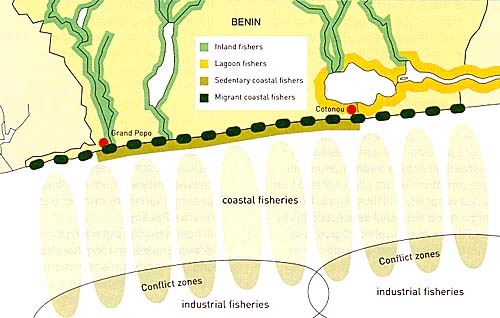 Sedentary artisanal fishers in Benin have access to good fishing waters near shore, and their landing sites are located near a road leading to urban markets. Mangroves and coco trees provide fuelwood, shelter and supplementary income and freshwater is readily available. Weather patterns do not pose a major risk. However, although customary practices and regulations exist to prevent overfishing, traditional methods of fishery management are breaking down, regulations are not enforced and industrial fishers regularly encroach on fishing grounds traditionally used by artisanal fishers. These factors threaten the sustainability of the small-scale fishers' livelihoods. Here, as elsewhere, local measures will be effective only if they are accompanied by increased efforts to control overfishing in international waters. Benin is benefiting from a major programme to strengthen community-based fishery management procedures, financed by the United Kingdom with technical support from FAO.